Kwang C. An in the kitchen of his Casino del Sol restaurant. Local restaurateur Kwang C. An walked out of retirement and into what quickly became one of the busiest chapters of his long and storied life. An, better known to generations of Tucson diners as Mr. An thanks to his more than 30 years in the local restaurant business—and a long-running advertising campaign with his "No. 1 son," former Arizona Diamondbacks player Luis Gonzalez—currently owns and operates Mr. An's Teppan Steak and Sushi, at 6091 N. Oracle Road, and An del Sol at Casino del Sol, 5655 W. Valencia Road. His frozen-yogurt shop FrozAn opened at the casino late last year. Since the beginning of this year, he has sold his original restaurant, Great Wall China, and taken over food concessions at Casino of the Sun, 7406 S. Camino de Oeste, with a new concept called An Express. And right in the middle one of the most lucrative and hectic periods he's ever known, An and the Pascua Yaqui Tribe's Yaqui Enterprises—which owns Casino of the Sun and Casino del Sol—are opening a restaurant called An the Bay on Coronado Bay in San Diego. An also recently met with representatives from Gila River Gaming Enterprises to discuss opening restaurants at casinos in the Phoenix area. "You know what? Since I came out of retirement, I work twice as hard, twice as busy," says An, who gave up on retirement in 2010. "My business actually doubled. ... The economy very bad, but I hired 200 people in last two years." An, now in his 70s (and unwilling to reveal his exact age), says he doesn't know how to cook, and that his success stems from hiring skilled employees who build trust with customers through "cleanliness, consistency and quality." He says he also tries to stay ahead of the competition by encouraging his chefs to use unique and expensive ingredients to create items not found elsewhere. But there's more to it than that. A self-described "workaholic," An arrived at our interview after a full morning of keeping tabs on various projects and attending a board of directors meeting for the Community Food Bank of Southern Arizona. He began before sunrise and would not rest until after sunset—and he does it every day. "I don't drink; I don't smoke; and I don't golf. My hobby is work," An says. "Lots of people laugh about it, but it's the truth. I work 12 to 14 hours every day." An developed his work ethic growing up with nine siblings in South Korea. Before the Korean War, his parents were successful businesspeople. After the war leveled the country, he watched them work long hours at multiple jobs just to make ends meet. An carried that work ethic with him into the Korean army and later to the United States, where found a job working for a construction company in Texas. He later took a construction job in Tucson, founded his own construction company, and branched into custodial services, dry cleaning and shoe repair. An says he was a single father for many years, and that one of the things he enjoyed most was taking his sons out to eat. Over the years, that affinity for restaurants grew, and in the early 1980s, despite no previous restaurant business, he purchased a small Italian restaurant at 2445 S. Craycroft Road and converted it into his first restaurant, Great Wall China. It did well, prompting him to open Sakura at 6534 E. Tanque Verde Road and, several years later, a second Sakura at 6091 N. Oracle Road. An eventually sold both Sakura locations; the Sakura on Oracle Road was purchased by a group that converted it into a Benihana. The restaurant never caught on, and the owners gave the restaurant back to An, who reopened it in 2010 as Mr. An's Teppan Steak and Sushi. An sold Great Wall China in 1990, but regained ownership of it in 2008. He sold the restaurant a second time in January. "Before Mr. An's and An del Sol opened, I been retired for two years. The reason I came out of retirement, I been crazy with nothing to do," An says. "I traveled around out of the country and all that, but I very, very tired of having nothing to do." An quickly found plenty to keep him busy. Shortly after opening Mr. An's on Oracle, he broke ground on a massive sports bar downtown at Fifth Avenue and Congress Street that was to be named An Congress. However, he eventually abandoned the project due to "too much red tape" and turned his sights on restaurants at the casinos. An del Sol was an instant hit. And business at Mr. An's on Oracle has grown to the point where there are hour-long wait times on weekend nights. His newest concept, An Express at Casino of the Sun, is modeled after a food court. 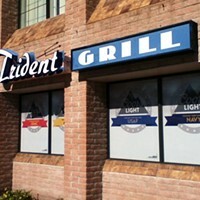 It serves Mexican, American, Chinese and Italian food, and employs about 30 people. An credits his wife, Christina, who handles the interior design of the restaurants, among various other duties, with most of his success. His son, Bin An, also is a big factor, having worked by his father's side since he was a child. An says his other passion is volunteer and charity work. In addition to sitting on the board of directors of the Community Food Bank of Southern Arizona, he donates heavily to fundraisers for the American Heart Association, the Boys and Girls Clubs and other groups. "The man has the biggest heart of anyone I know," says Bill Carnegie, chief executive officer of the Community Food Bank of Southern Arizona. "He's served on our board since October 2006 and has done some really unusual events for us. "Last year, he stepped it up and made a bet with Chris Edwards from Tucson Appliance," Carnegie says, speaking of a wager between Edwards and An to see who could collect the most turkeys during the holidays. "An lost—and ended up wearing a turkey suit ... in front of Tucson Appliance for a day." An says he'll eventually turn his restaurants over to Bin An, who currently manages Mr. An's on Oracle. An has been priming his son for the job since he was 9, and quips that the reason Bin An has yet to marry is because he's been too busy working to find a bride. "In Korean culture, people kind of keep to themselves, but my father has always been different. He embraces people, and he embraced Tucson, and Tucson embraced him right back," Bin An says. "I'm definitely very proud of everything he's accomplished. He literally came here with $500 to his name and speaking almost no English." Bin An anticipates a busy future, but says he's ready for it. "It looks like this business could explode into quite an empire. I'm excited about it," he says. "It'll be a lot of hard work, but he's been training me for that since I was a kid, to know that working a lot of long hours is no big deal."